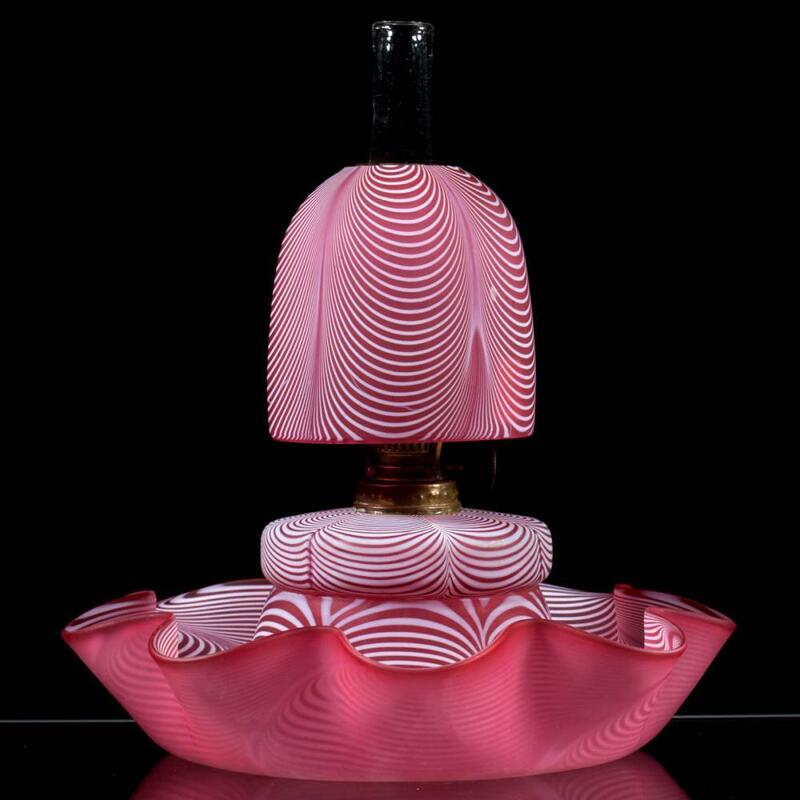 Featuring part one of the William A. Litle estate glass collection, Garden Grove, CA; part one of the important miniature lamp collection of Barbara and Moe Tourison, Concord, MA; good fairy lamps; a fine collection of antique and modern paperweights deaccessioned by the Strong National Museum of Play, Rochester, NY, to benefit the Collections Fund; fine American and European art glass; lighting including Tiffany and Pairpoint; plus more. All potential bidders must establish an account with JSE&A. In order for us to set up your account we will need a copy of your current driver's license or similar document showing your full name and physical address. We will also need your telephone number and email address for contact purposes. Your bid constitutes a legally binding contract. By bidding with Jeffrey S. Evans & Associates, Inc. either directly or through an online bidding platform (e.g. Auction Flex, Invaluable or LiveAuctioneers), you are agreeing to abide by all associated auction terms. Bidder approval is at the sole discretion of Jeffrey S. Evans & Associates. 1. The auctioneer reserves the right to reopen bidding on a sold lot (under extreme circumstances only) and is the sole determinant concerning all bid disputes and the final authority in regard to all auction terms and conditions. 2. All auction lots sold are subject to a buyer's premium. Payment in full is due on date of sale for lots won in person. 3. Unless exempted by law, all purchases are subject to a 5.3% VA state sales tax. VA state sales tax does apply to out-of-state, non-tax exempt buyers who pick up their purchases at our gallery in Virginia. 4. VA law requires that all dealers must have a valid, signed Virginia Dept. of Taxation Sales and Use Tax Certificate of Exemption on file with us (required per auction for non-Virginia dealers). Dealers licensed outside of the state of Virginia are also required to provide a copy of their resale tax exempt license/certificate for our files. 5. Phone and absentee bidding directly with our auction house, and not through a third party company such as LiveAuctioneers, is offered as a courtesy. We are not responsible for errors or unexecuted absentee or telephone bids. (Bidders may place bids themselves in person or online.) Our online absentee bidding is powered by Auction Flex. No online transaction fee is imposed on lots won by online absentee bidding through jeffreysevans.com via Auction Flex. 6. Non-Internet bids: If you do not have Internet access, you may fax, mail, or hand-deliver bids to us and we will enter the bids on your behalf. Non-Internet bids must include the auction date and a signed statement indicating that you accept all terms and conditions of the auction. Note: Your local library may provide Internet access for free, or for a nominal fee. 7. All absentee bids must be in written form. We cannot accept verbal absentee bids. Submitted bids that are not commensurate with our standard Bid Increments will be rounded up to the appropriate level. 8. We welcome international bidders; however, all communications must be in comprehensible English. 9. Make sure that you have the correct lot number! If you accidentally bid on a lot and win, you are still liable for payment as we are liable to the consignor. 10. Absentee bidders may be in competition with various LIVE bidders which may include FLOOR or ON-SITE/IN-HOUSE bidders (bidding in person at our gallery), INTERNET bidders (bidding in real time via computer) or PHONE bidders (bidding in real time via telephone). 12. Absentee bids placed in person at our gallery or through the Invaluable system are accepted at any time prior to the sale of the item. The deadline for all other absentee bids (e.g. bids placed through the catalogue on our site using Auction Flex, through LiveAuctioneers, mailed/emailed bids, and faxed bids) is two (2) hours prior to the start of the auction. 13. All Telephone bids are subject to a minimum opening bid per lot ($250 for calls within the USA and $500 for international calls). Phone bids must be arranged by 3:00 PM ET, the day prior to the auction We may reject requests submitted after our deadline. 14. We will notify all successful bidders by email (or by phone if no email) within 2 business days of the end of the auction. (All emailed invoices are normally sent on the first business day following the sale; however, if we have an extraordinarily high volume of invoices, some may be sent on the second day.) Post-auction instructions are on our website under BUYING>After the Auction. 15. Successful bidders are required to contact us to confirm receipt of invoice and to make arrangements for payment and shipping or pick up. EMAIL IS PREFERRED. Unless otherwise stated the deadline to contact us is 5:00 PM ET on the Friday following the auction (if sale was held on a weekend) or 5:00 PM ET on the Monday following the auction (if sale was held on a weekday). Calls to our office should be made during OUR business hours. 17. Any special payment arrangements must be pre-approved by an authorized representative of Jeffrey S. Evans & Associates. Such arrangements must be requested in writing, and authorization must be obtained prior to bidding. 18. See all categories under our BUYING webpage for additional auction terms and other important information. 19. Once an item is sold to an in-house bidder, the buyer assumes full risk and responsibility for said item. 20. Each returned check is subject to a $50.00 service charge. 21. Accounts that are unpaid after 25 days of the sale date will be subject to a 2% monthly finance charge; administrative fees may also apply. 22. The buyer is liable for all fees/costs associated with the collection of balances due, including attorney's fees. 23. Unless prior arrangements have been made with us, any merchandise not removed within 2 weeks of the sale date will be subject to a storage fee. Any merchandise not removed or consigned within 60 days of the sale date will be considered abandoned. Refund requests in regard to authenticity must also include at least one supporting written and signed statement from an authority recognized by the auctioneer. Refunds in regard to condition for items purchased in person at the gallery must be requested before the item in question is removed from the gallery. Lots catalogued without circa dates are not guaranteed as to age. No refunds will be considered on Oriental rugs which are sold strictly "as is" with no guarantee as to age, origin or condition. DO NOT return any item until a refund authorization has been obtained from Jeffrey S. Evans & Associates. Once a refund is approved AND the complete lot is returned to the satisfaction of the auctioneer (in the same condition in which the buyer received it), a full refund of the hammer price and buyer's premium will be issued. We do not refund shipping cost nor do we offer partial refunds. 25. Additional conditions of sale may apply, as noted on our website and/or as announced by the auctioneer prior to the auction. These terms and conditions, as well as the respective rights and obligations hereunder, shall be governed by and construed and enforced in accordance with the laws of the Commonwealth of Virginia. The purchaser shall be deemed to have consented to the jurisdiction of the state courts of, and the federal courts sitting in, the Commonwealth of Virginia. Condition Report: Undamaged lamp, collar with scratches. Burner with corrosion and several small repairs, chimney undamaged. Condition Report: Undamaged lamp and setup, scattered wear to decoration and some old touch-up black paint to one boot, shade with normal as-made roughness to rims. Condition Report: Undamaged lamp, shade fitter with as-made roughness. Burner with gallery losses and denting, chimney rims with roughness. Condition Report: Undamaged. Chimney with a minor underfill to the top rim, as made. Condition Report: Excellent condition, font undamaged, four toe tips with minor flakes/roughness, shade with a very minute flake to a petal tip. Setup undamaged. Condition Report: Undamaged lamp and setup, shade and chimney rims with normal as-made roughness. Condition Report: Undamaged lamp. Burner deflector with light denting, chimney undamaged. Condition Report: Undamaged lamp and setup. Condition Report: Undamaged lamp, shade fitter with lightly oil-stained air-traps. Burner thumbwheel frozen, chimney undamaged. Condition Report: Undamaged lamp and burner, one toe with a hint of roughness to the tip, chimney-shade rims with normal as-made minute flakes/roughness. Condition Report: Excellent condition, some scattered tarnish, oblong reflector with some minute denting. Condition Report: Font with a very light bruise to one rib, Burner will not tighten, otherwise setup undamaged.